The World Health Organization (WHO) selects Tobacco Industry Interference as the theme for World No Tobacco Day (WNTD) 2012. Interference by the tobacco industry is a constant threat to tobacco control efforts. As momentum is growing in the fight against tobacco and more and more countries are committed to meeting their obligations under the WHO Framework Convention on Tobacco Control (WHO FCTC), the tobacco industry is becoming more energetic and innovative in their efforts. Good public health policy depends on a clear-sighted understanding of the industry's tactics. A study recently published in the British Medical Journal details that of 90 universities and 16 medical faculties, 39% had received donations from the tobacco industry. Four of the 16 medical schools had received research grants. The WHO FCTC recognizes early in the preamble “the need to be alert to any efforts by the tobacco industry to undermine or subvert tobacco control efforts”. 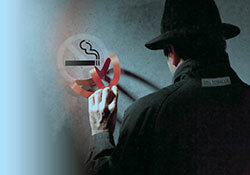 Furthermore, the guidelines to the implementation of Article 5.3 acknowledge that that tobacco industry interference cuts across a number of tobacco control policy areas, and helps ensure that efforts to protect tobacco control from commercial and other vested interests of the tobacco industry are comprehensive and effective. Parties are strongly urged to implement measures beyond those recommended in these guidelines when adapting them to their specific circumstances.